The GFS and NAM both presently show a somewhat powerful storm system cutting to the Great Lakes on Monday night and Tuesday. There is some indication of a secondary Low trying to develop along the NJ coast Tuesday during the day or evening that could affect the dynamics of the storm as well. Either way, there presently seems to be agreement the precipitation starts as snow Monday night into the Tuesday AM rush and then transitions to a period of sleet and freezing rain. That period of mixed/frozen precip is somewhat prolonged during the day Tuesday on some of the models. 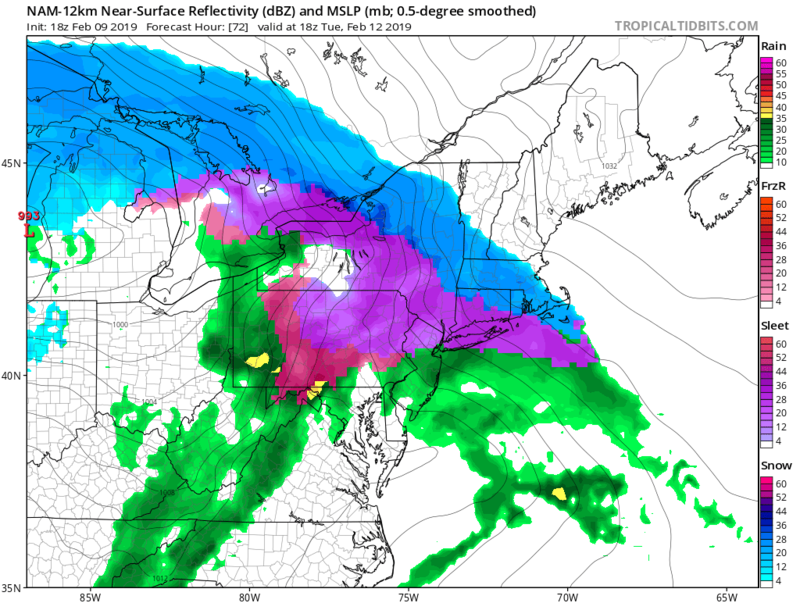 While this is not presently looking like a major snow event, due to the transition to mixed precipitation after daybreak Tuesday, it could be disruptive to the Tuesday AM commute as most of the area will still be in snow, sleet or freezing rain through at least late morning if not early afternoon. Looks to potentially hit many with a front-end thump of about 2-4" of snow (maybe some more further north where snow hangs in longer, a little less near the coast where sleet may mix in sooner). Timing right now would be snow starting around midnight Monday night and the changeover happening south to north after daybreak Tuesday. GFS eventually goes to a prolonged period of just rain Tuesday evening, while NAM only shows a brief changeover to all rain before ending altogether. Obviously details need to be worked out over the next 24-48 hours. TWC app, which I put little stock in has me with 3-5” of snow Tuesday morning before mixing with ice and sleet in the afternoon. That’s a little overdone on the snow total I think but if I get even half of that followed by prolonged ice and sleet Tuesday will be a mess. I think some folks may get 4”+ just on Sunday night into Monday. Could be 195 On south. This will probably have some surprises. One thing is becoming clearer surface temperatures are going to be slow to rise. heehaw453 wrote: I think some folks may get 4”+ just on Sunday night into Monday. Could be 195 On south. This will probably have some surprises. One thing is becoming clearer surface temperatures are going to be slow to rise. 0z GFS has the snow hanging tough. This is around 10 am Tuesday. Would have been snowing for several hours in many places at this point. Just saw on TWC online 3-5 for me, I will be very happy to see that, sadly second biggest snow this year of so LOL, well second snow period. Whats up with the NAM giving almost all of PA a godzilla and then almost nothing east and even north of there, I mean not nothing but comparative, it looks like the first art goes through PA then gets suppressed south to miss us. Why is there no SCI or mention of this snow chance on front of page? I guess Frank does not feel NYC will see 1 inch of snow at all? jmanley32 wrote: Whats up with the NAM giving almost all of PA a godzilla and then almost nothing east and even north of there, I mean not nothing but comparative, it looks like the first art goes through PA then gets suppressed south to miss us. I believe Frank said he was going to be away this week. Ahh yes thats right, well look at that away again and we have snow in the forecast. He was away in Nov and look how it way over performed. Look for the same here, scott I think you should take over and Frank needs to move out of the area LOL, totally kidding. 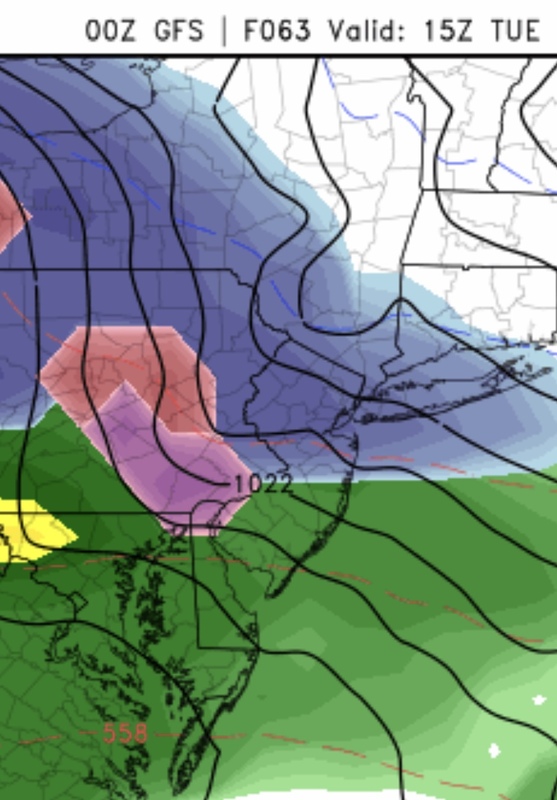 Euro shows major freezing rain event for a enourmous area of .25 to 1.0, though this did not pan out at al last time, its pretty unikely it will but who knows. Frank is in Spain. I have to wake my son up for a Futsal game and then Im goig to the Islander game later so I cant do as detailed of an alysis as Id want but take a quick look at the two images below. First is the surface as the moisture is just about to move into the area. Nice HP, avging 1039-1041 on modeling) parked to our N. Honestly cannot complain here. Maybe Id shift the center S just a tad but really its not bad. Butlook at the HP in western Canada. Not as well defined and weaker. Here is the 500mb anomaly map. Notice the EPO region. Unfort there is a negative(cool colors) that is splitting Alaska in half. As you can see there is some ridging/blocking extending into part of the EPO region but honestly I would have liked to see it extend further N as indicated by the yellow dashed line. This would have created a much stronger push of cold from the N. Instead the lack of reinforcing cold air, strong HP, behind our nice HP parked to our N is a weakness on the western flank of said HP to our N. Because the S energy is so strong it allows our primary to find this weakness and cut well to the west, but it also serves to allow the primargy energy to scour out the cold with less resistance to the N. Prev modeling had a stronger Alaska ridge and a secondary popping of the Delmarva tarcking S&E of LI which would aid in keeping the lower levels with a more NEasterly wind flow. The secondary now appears to track over us instead which allows the easterly flow to develop sooner. The CAD should still be strong enough for all snow for everyone at the start. Hree is uptons discussion and honestly I couldn't have said it better myself. the 12z suite of models. forecast, which is currently zero for more than half of this area. tenth or two of ice, but this might be underdone as well. These boundary layer storms always tough calls. The first wave is all snow and could drop a few inches. EPA I like 3-5” all snow, 1.5” sleet/graupel and .25 zr. Then ending as rain. Absolute potpourri of precipitation types probably. One thing is surface temperature will be well below freezing for good portion of event so whatever falls accumulates. In this winter that’d be as significant as seen since November. heehaw453 wrote: These boundary layer storms always tough calls. The first wave is all snow and could drop a few inches. Yeah details with these types of storm often need now cast. Heehaw and Scott beat me to the punch. Looking at the 6z runs I’d say throw out the snow/ice projections and focus on temps. There is no way the models can nail exact amounts on a system like this because the dynamics may be very localized. The 6z runs all show the cold air at the surface not budging for most of Tuesday. Many areas don’t get above freezing until after 3 or 4 pm - if then. Even at the 850 level the 0* line stays south of most of the area until afternoon. This leads me to believe this will be far more snow sleet and freezing rain than just plain rain (which will come, but not until evening). The key to accumulation is exact timing of changeovers and intensity during those times. If the snow lasts just a couple hours longer somewhere, and it gets heavy during those couple hours, that’s a difference between maybe 2” vs 4 or 5”. If the sleet lasts four or five hours, while it doesn’t accumulate as fast as snow, it will accumulate. And all you need is an hour or two of freezing rain for all sorts of problems. I think this will actually be a very disruptive storm Tuesday despite what may look like paltry snow totals to some. And I don’t think we’ll even get a fix on those totals until it’s happening. The focus of this system should be more on the problems it can cause than pure amounts because it hits before AM rush and may actually continue almost into the PM rush for many before you see any non-frozen rain. 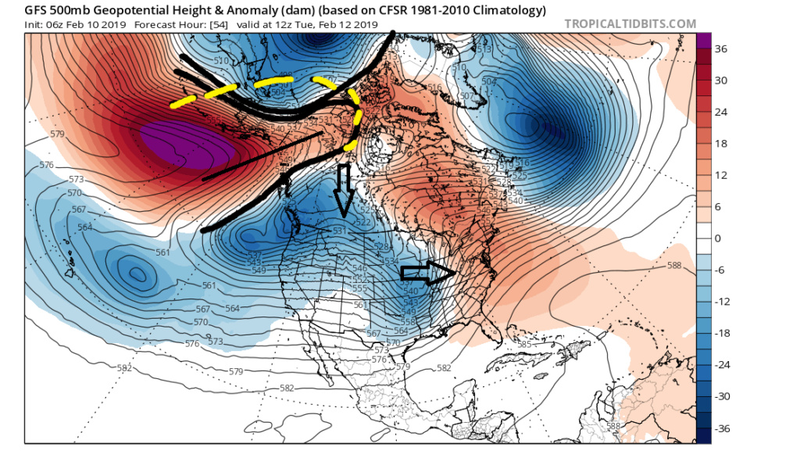 Also remember, the GFS was pretty good with the January storm in projecting a warmer mainly rain event. In this case it is bullish on the entrenched cold air. So if it had a bit of a warm bias that largely panned out in Jan, can’t say it is a cold bias now. Thanks for the write ups Bill, SROC, JMAN and Heehaw. This has been pretty consistently forecast for the southern portion of the board as front end to snow to mix to rain. From the overnight guidance, looks the backend rain will be the more the dominant feature. Of course. So, here's how I (just for me) define success this time out: That front end thump must include 3-4 hours of good day time snow, with no school. So, a snow day or delay with accumulating snow holding out for most of the morning. Let the kids have some real fun out it. I work from home...I just realized I'm wishing for most of you to have a commute from hell Tuesday morn. (Bad form SENJ!) Sorry!! I don't have a clue about slop amounts but N and W will have more of it in situations like this.NWS has me at 3 to 5 ATM.Tonight looks like just a dusting.Wednesday gets into the 40's and the next storm looks like mild and rainy. Bill, as far as precip types/snow totals for any storm, but def for a boundary layer storm, I just take the mean projection (for my areas it is 2") and then figure 1/3, 1/3, 1/3. 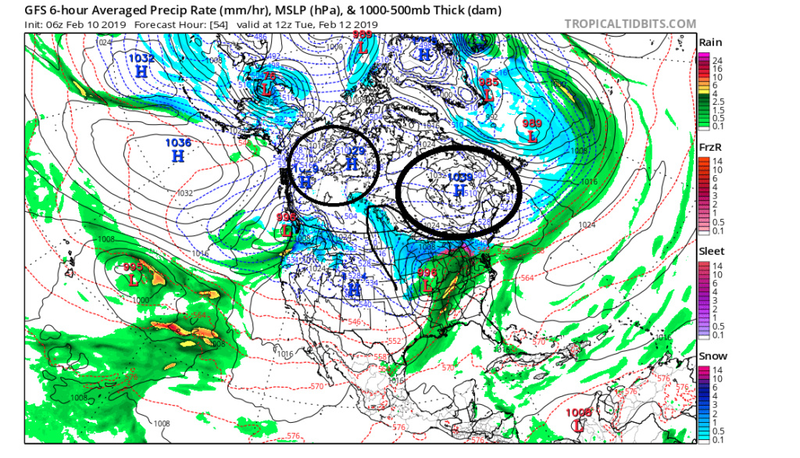 Doc...GFS shows 3 or 4 straight cutters in the long range, this might be the shot for a bit. Yeah SENJ, the worst spot for this type of system is always the NJ coast and far south NJ, where the changeovers happen much more quickly. What would benefit you is if the secondary Low stayed off to our east. That said the cold air on the modeling doesn’t give in easily even at the coast so you could wake up to snow Tuesday AM. As for school closings. Lol. I’ve seen them close for 1” of snow and for COLD this winter. Lol. If they don’t close in most areas of Central/Northern NJ for 2-4”/3-5” of snow, with sleet and freezing rain on top I’d be shocked. billg315 wrote: Heehaw and Scott beat me to the punch. Looking at the 6z runs I’d say throw out the snow/ice projections and focus on temps. There is no way the models can nail exact amounts on a system like this because the dynamics may be very localized. The 6z runs all show the cold air at the surface not budging for most of Tuesday. Many areas don’t get above freezing until after 3 or 4 pm - if then. Even at the 850 level the 0* line stays south of most of the area until afternoon. Very well said. I totally agree with your point about a disruptive storm. Surface temperatures mean a lot in that regard. The GFS verbatim has you in snow or sleet until about midday SENJ. So whilevthis very much a nowcast event, I think you’ll have some wintry precip to look at in daylight. I hope so at least (for after all, once you changeover, my region is always next in line, lol).